V.Bulavko. Concert Piece on Ukrainian Folk Theme "Handzya"
Video demo: Vladimir Zubitsky. Children Suite, Winter Way (1st piece). Video demo: J.Brahms. Hungarian Dance No 5. 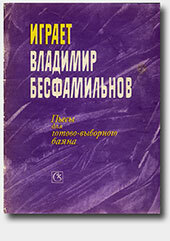 Transcription by Ivan Yashkevich. Video demo: V.Bulavko. Concert Piece on Ukrainian Folk Theme "Handzya".